Sofas are meant to be relaxing, and sinking your tired body onto a comfortable one is one feeling that not many others can beat. Well, how about having the sound of some water flowing in the background to further enhance your relaxed mood? 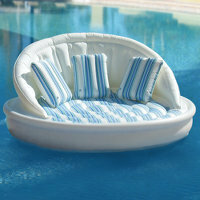 That is now made possible thanks to the Floating Sofa, measuring 68″ in diameter. This inflatable waterborne sofa is able to comfortably seat three adults – could some of you have naughty thoughts with that piece of information? It is meant for use in swimming pools or other calm waters, featuring a platform that keeps loungers 8″ from the water’s surface while being easy to board. A trio of inflatable pillows complete the collection, where it is made from resilient PVC that is both puncture- and UV-resistant, with a maximum weight support of 350 lbs. Nice to know this $179.95 device comes with a battery powered pump that is able to inflate and deflate the Floating Sofa within minutes. I am having trio thoughts lmao!